SPT-QSFP-LR4 is designed to operate over single-mode fiber system using 4X10 CWDM channel in 1310 band and line converts 4 inputs channel of 10Gb/s electrical data to 4 CWDM optical signals, and multiplexes them into a single channel for 40Gb/s optical transmission. Reversely, on the receiver side, the module optically de-multiplexes a 40Gb/s input into 4 CWDM channels signals, and converts them to 4 channel output electrical data. The central wavelengths of the 4 CWDM channels are 1271, 1291, 1311 and 1331 nm. It contains a duplex LC connector for the optical interface and a 38-pin connector for the electrical interface. Single-mode fiber (SMF) is applied in this module. This product converts the 4-channel 10Gb/s electrical input data into CWDM optical signals (light), by a 4-wavelength Distributed Feedback Laser (DFB) array. The 4 wavelengths are multiplexed into a single 40Gb/s data, propagating out of the transmitter module via the SMF. The receiver module accepts the 40Gb/s optical signals input, and de-multiplexes it into 4 CWDM 10Gb/s channels. Each wavelength light is collected by a discrete photo diode, and then outputted as electric data after amplified by a TIA. 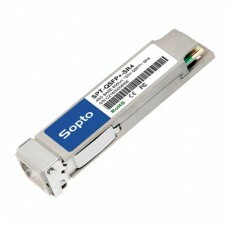 The product is designed with form factor, optical/electrical connection and digital diagnostic interface according to the QSFP+ Multi-Source Agreement (MSA) and compliant to 40G QSFP+ LR4 of IEEE 802.3ba. 1. Connected directly to TX data input pins. AC coupled thereafter. 3. into 100 ohms differential termination. 4. 20 – 80 %. 5. Loss Of Signal is LVTTL. Logic 0 indicates normal operation; logic 1 indicates no signal detected. 6. Receiver sensitivity is compliant with power supply sinusoidal modulation of 20 Hz to 1.5 MHz up to specified value applied through the recommended power supply filtering network. 1. GND is the symbol for signal and supply (power) common for QSFP+ modules. All are common within the QSFP+ module and all module voltages are referenced to this potential unless otherwise noted. Connect these directly to the host board signal common ground plane. 2. VccRx, Vcc1 and VccTx are the receiving and transmission power suppliers and shall be applied concurrently. Recommended host board power supply filtering is shown below. Vcc Rx, Vcc1 and Vcc Tx may be internally connected within the QSFP+ transceiver module in any combination. The connector pins are each rated for a maximum current of 500mA. It also provides a sophisticated system of alarm and warning flags, which may be used to alert end-users when particular operating parameters are outside of a factory-set normal range. The operating and diagnostics information is monitored and reported by a Digital Diagnostics. Transceiver Controller (DDTC) inside the transceiver, which is accessed through the 2-wire serial interface. When the serial protocol is activated, the serial clock signal (SCL pin) is generated by the host. The positive edge clocks data into the QSFP+ transceiver into those segments of its memory map that are not write-protected. The negative edge clocks data from the QSFP+ transceiver. The serial data signal (SDA pin) is bi-directional for serial data transfer. The host uses SDA in conjunction with SCL to mark the start and end of serial protocol activation. The memories are organized as a series of 8-bit data words that can be addressed individually or sequentially. The 2-wire serial interface provides sequential or random access to the 8 bit parameters, addressed from 000h to the maximum address of the memory. This clause defines the Memory Map for QSFP transceiver used for serial ID, digital monitoring and certain control functions. The interface is mandatory for all QSFP devices. The memory map has been changed in order to accommodate 4 optical channels and limit the required memory space. The structure of the memory is shown in Figure 2 -QSFP+ Memory Map. The memory space is arranged into a lower, single page, address space of 128 bytes and multiple upper address space pages. This structure permits timely access to addresses in the lower page, e.g. Interrupt Flags and Monitors. Less time critical entries, e.g. serial ID information and threshold settings are available with the Page Select function. The structure also provides address expansion by adding additional upper pages as needed. For example, in Figure 29 upper pages 01 and 02 are optional. Upper page 01 allows implementation of Application Select Table, and upper page 02 provides user read/write space. The lower page and upper pages 00 and 03 are always implemented. The interface address used is A0xh and is mainly used for time critical data like interrupt handling in order to enable a “one-time-read” for all data related to an interrupt situation. After an Interrupt, IntL, has been asserted, the host can read out the flag field to determine the effected channel and type of flag. For more detailed information including memory map definitions, please see the QSFP+ MSA Specification. The lower 128 bytes of the 2-wire serial bus address space, see Table 1, is used to access a variety of measurements and diagnostic functions, a set of control functions, and a means to select which of the various upper memory map pages are accessed on subsequent reads. This portion of the address space is always directly addressable and thus is chosen for monitoring and control functions that may need to be repeatedly accessed. The definition of identifier field is the same as page 00h Byte 128. The Status Indicators are defined in Table 2. Digital state of the IntL interrupt output pin. Indicates transceiver has not yet achieved power up and monitor data is not ready. Bitre mains high until data is ready to be readat which time the device sets the bit low. A portion of the memory maps (Bytes 3 through 21), form a flag field. Within this field, the status of LOS and Tx Fault as well as alarms and warnings for the various monitored items is reported. For normal operation and default state, the bits in this field have the value of 0b. For the defined conditions of LOS, Tx Fault, module and channel alarms and warnings, the appropriate bit or bits are set, value = 1b. Once asserted, the bits remained set (latched) until cleared by a read operation that includes the affected bit or reset by the ResetL pin. The Channel Status Interrupt Flags are defined in Table 3. The Module Monitor Interrupt Flags are defined in Table4.